I was excited when I knew I would be checking into the Watergate Hotel. Imagine, I’d be where history was made on June 17, 1972. That day a break in was discovered at the Democratic National Committee headquarters. That of course led to the resignation of President Richard Nixon on August 8, 1974. Imagine, it was a security guard named Frank Wills who happened to discover the break in. 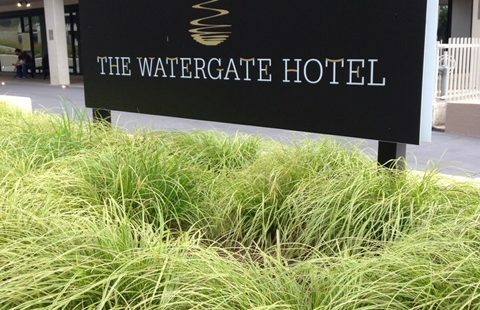 The Watergate Hotel re-opened June 1 (originally opened in 1967) after a $125 million six year renovation. It was purchased by Jacques and Rakel Cohen for $45 million. There were other owners along the way. They are a married couple from New York. Besides the huge sum of money that was spent, so was time in getting the hotel back to its historic beginnings. Today it has a retro look. That is proved by the very outfits the female staff wear and the retro music in the lobby, loud at times (at least to my ears). The furniture has been custom made to look like the 60’s. There are 336 rooms and I have to say mine had a great view. Peering out I saw Georgetown, the Potomac and Virginia. The hotel isn’t completely finished yet. For example, the formal dining room is being prepared. That will be called Kingbird. I’m told to look for a mid-August open. The casual dining room, with the same name, and now open, serves all three meals. There will be separate menus. Another area yet to open is the rooftop bar to be called Top of the Gate. It is open and will soon be heated. Food will be available and it provides outstanding views of the D.C. and Virginia. This should be open sometime in August. A spa will also be opening soon. The hotel also has a ballroom, a library, the Next Whiskey Bar, with 2500 whiskey bottles making up some of the walls and very nice bathroom amenities. By the way, the original design of the building was developed by an Italian firm on 10 acres right there on the Potomac. Of course the outside design is iconic in the city. When re-doing the hotel that could not be touched because it is listed on the National Register of Historic Places. To clear up what I think is a point of confusion – the break in did not occur at the hotel. It happened at one of the office buildings which makes up the Watergate complex. There are six buildings in all, three condos, two office buildings and one hotel. 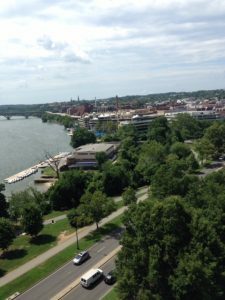 The Watergate Hotel, 2650 Virginia Avenue Northwest, has a great location. Georgetown is about a 15 minute walk and the Kennedy Center is next door. And the Potomac River is also a stones throw away. You can’t swim in it, but you can rent water vehicles. If you want to spend the night, room rates, and they can and do vary with time of year and location of room, will run between $300.00 and $1500.00. Incidentally, if you want to stay in the rooms that the burglars used the night of the break in they are 214 and 314. But don’t bother! They are totally different and who cares? If you want to reach the hotel call 202-827-1600 or go to: thewatergatehotel.com. I think the folks in D.C. are glad to have the Watergate back in operation. I also have to believe many people will show up if for no other reason than curiosity.